When one of our experts brings a storm cleaner to your Orlando, FL property, he or she can use a high-pressured water sprayer to clean out any crevices in the drain. A storm drain is an important aspect of many homes in the Orlando, Florida area, where heavy rainstorms, hurricanes, and other natural disasters are more common. If your storm drain is clogged with dirt and other debris, it will not be able to handle or drain the water before it starts flooding your home. It is important to make sure that your storm drain is clear of any clogs on a regular basis, so your home can stay dry and protected from any storms. One good storm cleaner tool is a heavy-duty vacuum that can remove any clogged dirt from the drain. You can use a shop-vac or schedule an appointment with us to bring a storm cleaner to your home or office to perform the cleaning. Storm drain cleaning also helps to clear out water that may be stuck in the drain, which can reduce odors or water accumulation. Even during a small storm, your storm drain will be working hard to move the water away from your foundation and into the pipes. This means that there may be small amounts of water and dirt left behind. When one of our experts brings a storm cleaner to your residential or commercial property, he or she can use a high-pressured water sprayer to clean out any crevices in the drain. If you have questions about storm drain cleaning, give us a call at Pat’s Pump & Blower. Our team can offer assistance with this important process. 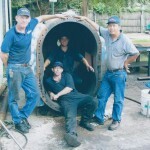 We also carry a variety of pumps and perform service and maintenance on most of the top pump brands.